I somewhat resent J.J. Abrams for having taken the joy out of my hate. Next thing you know, I’ll be drawing little hearts around “Edward + Bella 4ever” on my new Twilight Trapper Keeper. Anyway. Star Trek. In my latest bout of agreeableness toward the franchise, I responded with something unnervingly far from disdain and scorn when one of my favorite cake-makers sent me the details on this Banana Nutella Star Trek communicator cake. The timing of this cake couldn’t have been better with the recent release of the movie, though I think that was purely coincidence. Aurora, who ordered the cake for Brad actually knew very little about Star Trek, and left the choice of the design up to Rick. All she knew was that he was a Trekkie and was relying on us for the rest. I asked her if he spoke Klingon, because I was curious if he was that kind of Trekkie. She didn’t think he did. Knowing that the guest count wasn’t terribly large and that it was a birthday cake for an office party, Rick decided on the Star Trek Communicator. I showed [Aurora] some photos on the internet and I sensed a huge grin through the phone as she got very excited about the idea and thought it would be perfect! The Communicator is pretty damn geeky and pushes all our right buttons. I’m sure Aurora got her money’s worth with this latest delightful cake from cakelava, but I hope Sasha didn’t charge extra for any terrible puns. Thanks to Sasha and Rick for the latest in a glorious line of geeky cakes. Impress your own nerd friends with a replica Star Trek Communicator. That’s great! I want one! So glad you are feelin the love. We need more cakey details. What’s the vertical part made of? Edible? Geeky yes, but very cool. 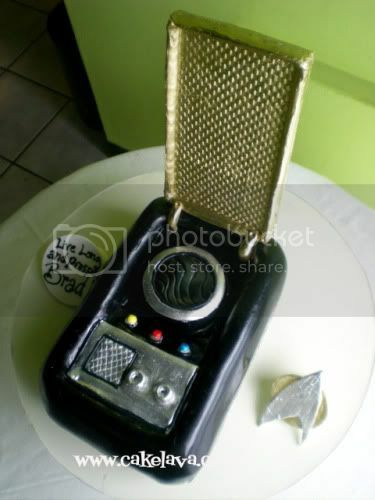 I’m not even that into Star Trek but would still love this cake! A Vampire Attacked My Geeky Cake of the Week!